So when most people think of Las Vegas, thoughts that you wouldn’t want to tell your kids might come to mind. While I like the shows, the over the top casinos, dancing & drinking…I like it in a much tamer way than some people! 🙂 Let’s just say that those that know me, wouldn’t guess Vegas as my favorite place. However, I have been to Vegas several times, none the less. 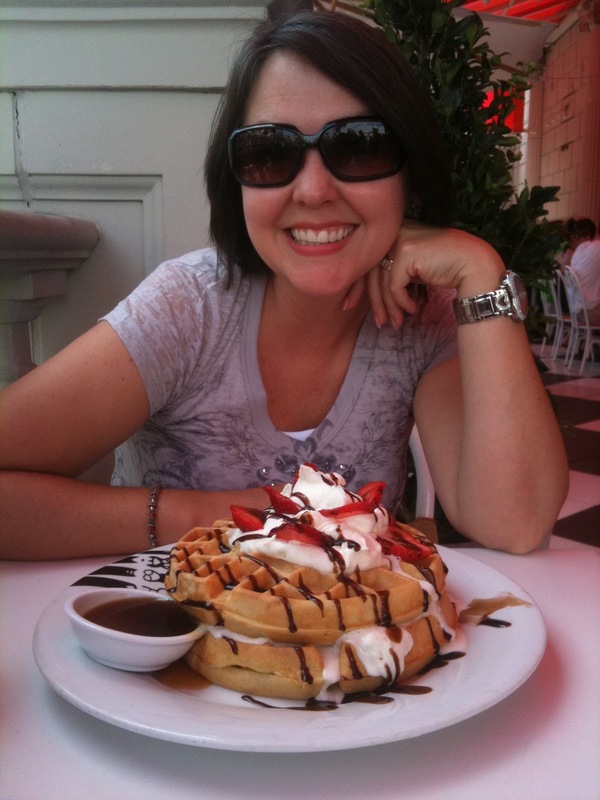 On the most recent trip, I discovered Serendipity 3. Wow! Super yummy! Those are Balsalmic Strawberry Cream Waffles that I am about to devour above. Freshly Sliced Strawberries, Macerated in Balsamic Glaze & Cream, Sandwiched between 2 Jumbo Waffles, Topped with Fresh Strawberries & Drizzled in Chocolate. And I know this is hard to believe and quite ridiculous, but then I had the Frozen Hot Chocolate! And honey, it was AMAZING!!! These are the kinds of excess I enjoy in Vegas! Mostly I have stayed at the Paris Hotel. This was the view from the room, over looking the Bellagio Hotel and fountains. I would ask for this view if staying here, the back view isn’t as nice. The Paris is your basic Vegas hotel, tons of rooms, restaurants, entertainment all in an enclosed environment so you have no idea the time or weather outside. I like the feeling of walking down the streets in Paris though. And they have several good in-house places to eat. hotel. I enjoy all meals there, but especially breakfast. and cheese sandwich with a fried egg in there as well). each have a coffee for under $15. The Paris hotel also has a fun piano bar and another bar that sits right in the middle of it all. 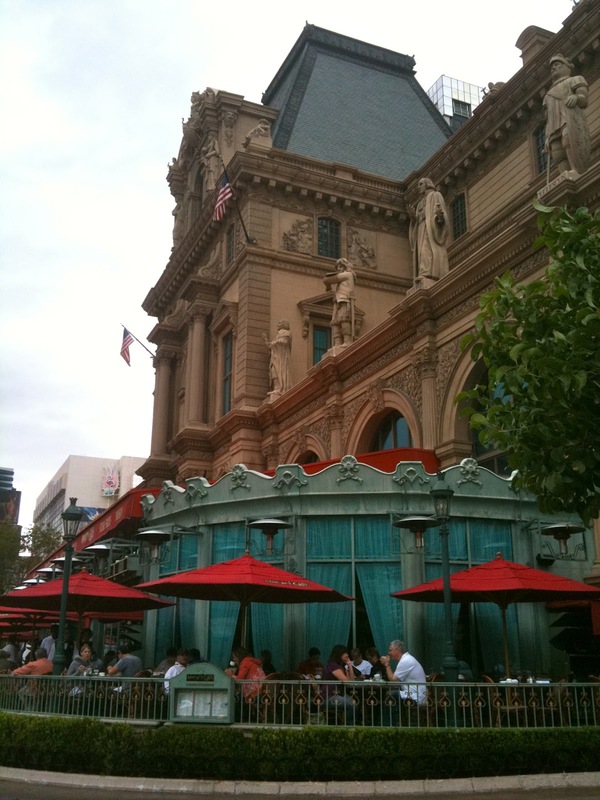 Great for people watching, one of my favorite Las Vegas activities. The location is a great one on the strip. You can walk anywhere or take those new monorails. I have this theory, if I have money in my pocket, I like to keep it there. So I am not a gambler. I do enjoy spending $20 or so on the nickel slots, but that is about it. So I spend my time in Vegas doing other things…like shopping the Forum shops without really buying anything. Remember, I said I like to keep my money in my pocket! 😉 There are lots of cool stores that you won’t see in small towns across America. Just enjoy looking around. Then go to Target!One place worth mentioning is Capo’s restaurant. So much fun and worth the 15 minute drive from the strip. If you go, I suggest the “Angel’s With Dirty Faces”. The restaurant really takes you back to the mobster days. Lots of fun! Even if you don’t go, check out the website. Mainly, I want people out there like me, who don’t like to gamble or party too hard, to know that you can have a good time in Las Vegas. There is so much to do here for everyone, no matter what your “style” is. So go, have your own fun, and tell me all about it in the comments! Also check out The Best of the USA link for other great places in the good ole USA! 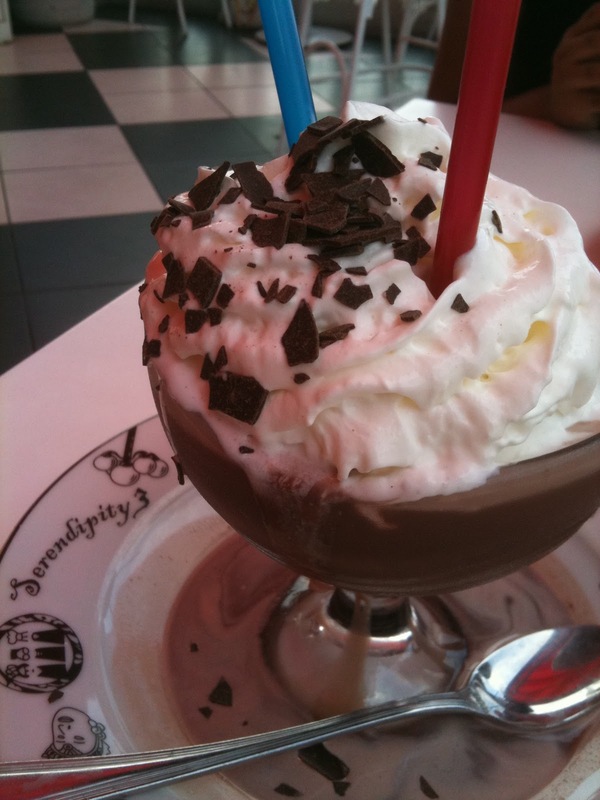 My daughter and I ate at Serendipity in NYC, specifically for the Frozen Hot Chocolate. We shared it and couldn't finish it. It was huge! I really thought your frozen hot chocolate looked small compared to ours but it's hard to tell. Our cup was dinner plate sized. It could also have been because it was kind of cold in NYC and we had just finished walking in the rain to get to Serendipity- maybe we just weren't in the frozen treat kind of mood.